The first day in any new location is always a bit disorienting, even more so when you are sleep-deprived and a bit overwhelmed by your surroundings. 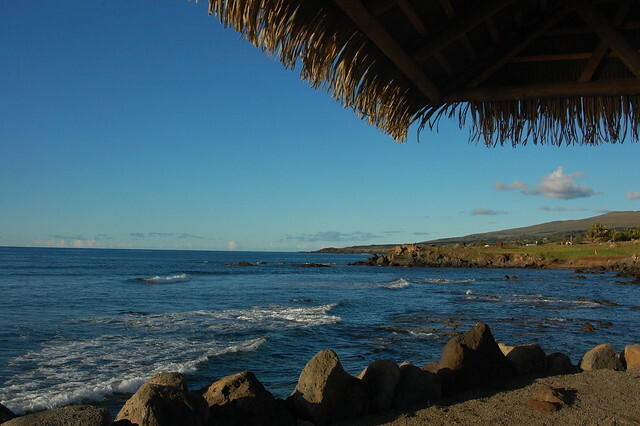 After seeing the gorgeous island appear in the deep blue sea from my window on the plane, it started to hit me that I was really on an isolated island, in a tropical climate, a place that so many will never get the chance to visit. This trip was already special. 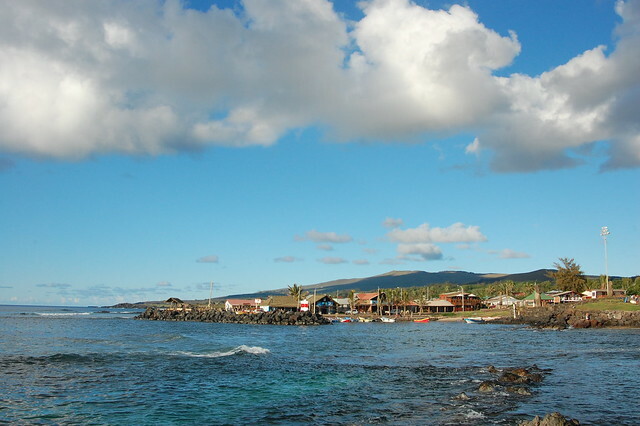 Touching down to Rapa Nui is a unique experience, since the runway is the length of the island. Upon landing, the plane has to turn around and head back the way it came in order to taxi to the gate. When you descend from the plane, you walk right on the tarmac, surrounded by palm trees, blue skies, and the heat of the tropical sun. 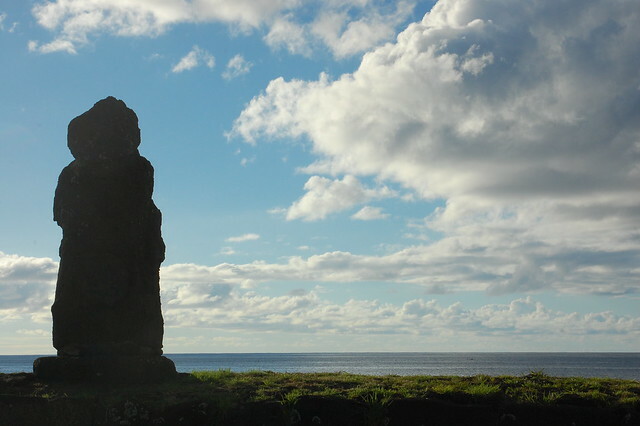 You begin to see clues to what you’ll experience on the island, with signs in Rapa Nui, the language of the island, and artwork reminding you of the moai you’ve come to see. And then you have a lot of waiting in lines to do. 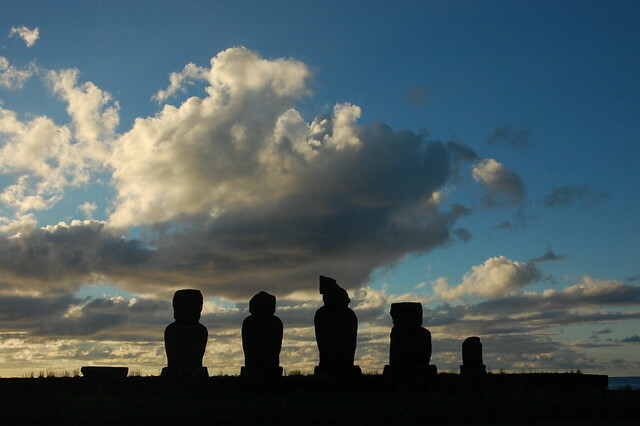 National park passes are sold right at the airport, where they are only $50 instead of the normal $60; they admit you to the two major attractions of Rapa Nui, Orongo, the ceremonial center of the birdman cult, and Rano Raraku, the quarry where the moai were forged. From there, you pass through immigration and then customs, where Chile continues to prevent fruit flies from entering its country by X-raying every bag! After I made it through the airport, I stepped outside, looking for a representative from the residencial I was staying at, Vaianny. I was somewhat awkwardly presented with a lei of fresh flowers, which is the traditional Polynesian-style welcome, and to be honest, my lei had seen better days. 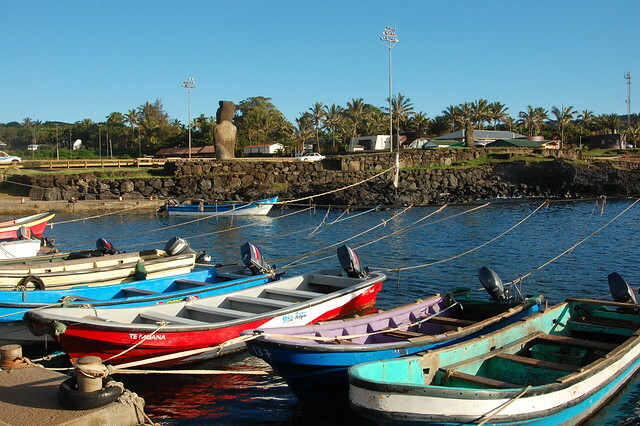 😉 My guide drove me into town, giving me a basic tour of the layout of Hanga Roa, and showing me my first moai, which is located in the center of town. At Vaianny, I checked in to my single room, the first time I would not be sharing a room in a very long time. I’d almost booked a dorm room, but I’m so happy I had my privacy and the ability to recover from group living. After discussing the major sites to see on the island, I decided to take a little nap. 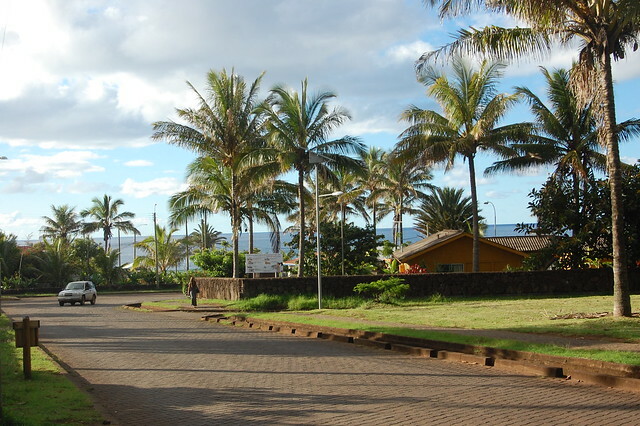 Since I had an entire week on the island to explore, I decided to spend the first afternoon walking around Hanga Roa and getting a sense of where I was staying. There isn’t much to see in Hanga Roa proper, but I appreciated the chance to just wander around with all the green plants and flowers, after so much time in dusty Huaycán! As late afternoon hit, I wandered down to one of the small harbors, where I found a delicious gelato place called Mikafe. I ended up getting gelato there almost every day. 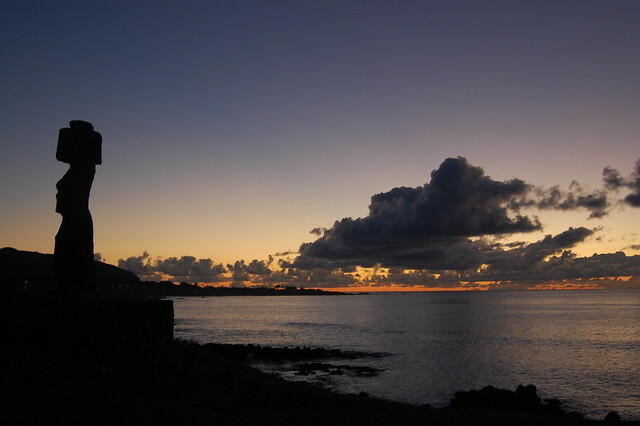 I basked in the late afternoon sun and enjoyed the sound of the waves before walking out of town towards Ahu Tahai, well-known as the best place to watch the sunset. There were tons of other visitors spread around the grass, many with serious photography set-ups and tripods, others just there to observe. 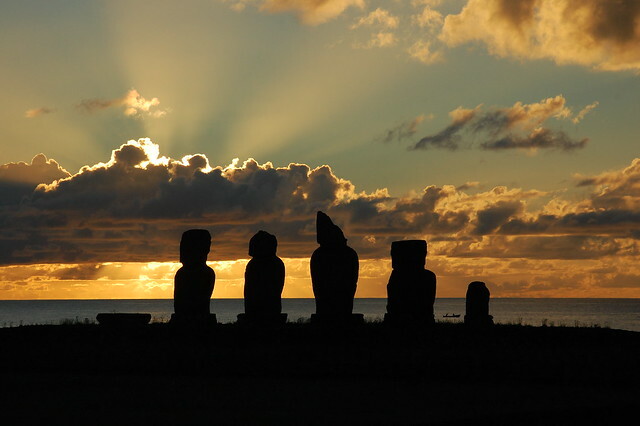 I wandered around, taking in the angles, admiring these restored moai. And then the sun began to set, with its rays sneaking out from behind the clouds and illuminating the sky. Gorgeous. After the sun disappeared from the sky, the place began to empty out, but I lingered, knowing that dusk brings lots of other beautiful colors. 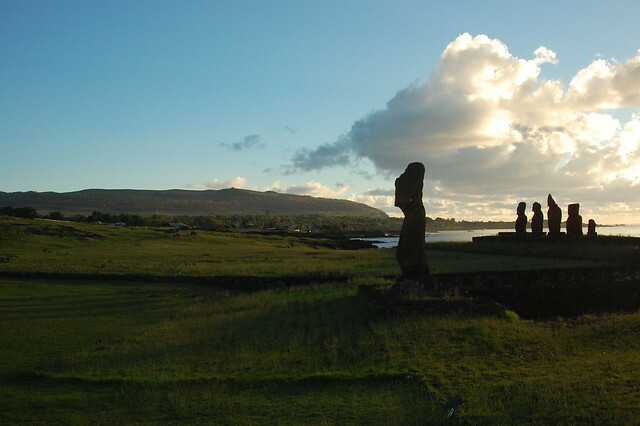 I headed over to the lone moai at Ahu Ko Te Riku, and took pictures looking back towards the town with the horizon changing colors. As I was standing there snapping shot after shot, I ended up chatting with a fellow solo traveler who’d also lived in Boston and currently lives in NYC. 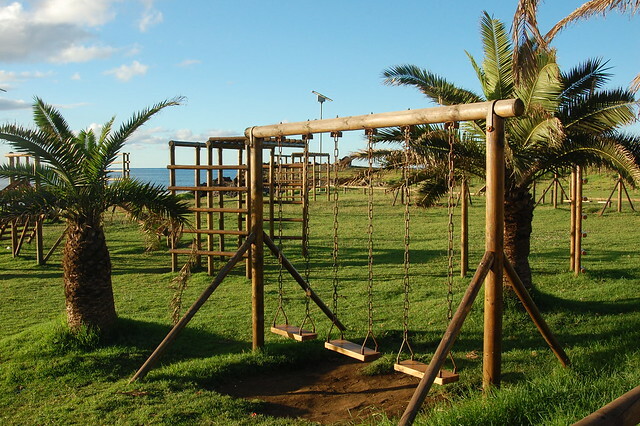 We decided to head back to Hanga Roa to grab a bite to eat together. That’s one of my favorite parts about travel; you connect with people much more easily.